Have you ever walked around the cemeteries of New York reading the old tombstone inscriptions? Well, if that’s not your thing, we’re here to point you in the direction of George Spencer Millet’s grave in Woodlawn Cemetery, which tells a tragic and unusual story. His headstone reads: “Lost life by stab in falling on ink eraser, evading six young women trying to give him birthday kisses in office of Metropolitan Life Building.” This happened the day after Valentine’s day, on February 15th, 1909—which also happened to be his 15th birthday. Amazing invention? It appears to me to be a law suit(s) waiting to be filed. At first glance, the Neck Air Traction System sounds reasonable. 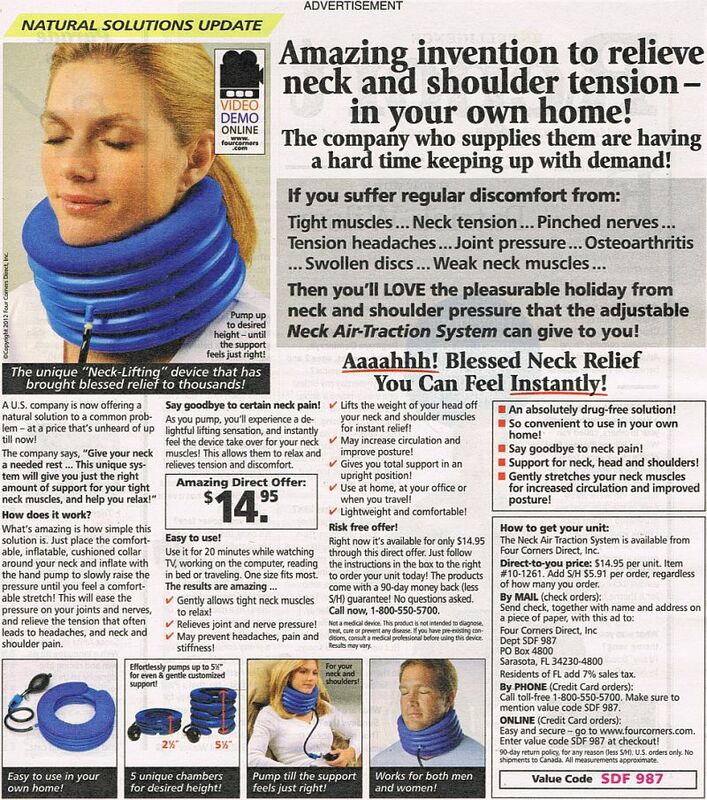 Neck is sore – place device around neck – inflate to stretch neck – no more pain! What could go wrong? It can be used at home and the office, by both men and women, and it’s only $15. This thing reminds me of the Padaung women of Myanmar, who stretch their necks with copper coils. While visiting my local Big Lots store, a box of granola bars caught my eye. I picked up the box of Nature’s Path Sunny Hemp Chewy Granola Bars. Upon closer inspection, I noticed a very suspect leaf on the front of the box and the ingredients list includes hemp seeds. At that point, I thought WTF! Of course, I had to buy a box – $2.50 for a box of 6 bars – not bad. The back of the box includes this serving suggestion -“Just the thing for when you’ve got the munchies.” But what about active ingredients? Do the bars contain any drugs? According to the Nature’s Path website – “Rest assured, eating our foods with hemp will not result in a positive drug test. We have our hemp products tested by two independent labs to determine the level of THC in the food. Both labs are able to test down to one part per million and report finding no detectable THC. ” What do you expect for $2.50? The bars appear to be standard chewy granola bars. I found the taste to be bland. Raisins were few and far between – one bar had none (see image below). Sunflower seeds can be tasted, but I am not a fan of sunflower seeds in a granola bar. The only pleasant flavor came from the molasses and cane syrup used to glue the granola together. Eating one bar did not produce any ‘side effects’. I will not buy another box. The BBC polled their readers about their predictions for life in the year 2112. They picked the best ones and had 2 experts review the likelihood of each of them becoming reality in 100 years. Very interesting article. Read it HERE.